Wood fences have always been the traditional style and have a classic look to them, adding to your home’s curb appeal. 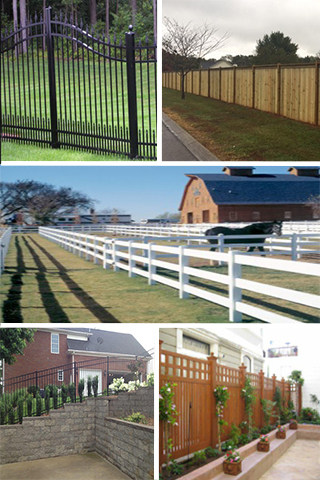 The cost is quite affordable and less than other fence styles. Wood fences can also be stained/painted in any color, whereas other fence styles, such as chain link, are very limited in the color selection. Also, repairs to a wood fence are generally easy and inexpensive, and the homeowner can often repair broken/loose/missing boards themselves. Wood fences will require more maintenance to keep the wood protected, often requiring annual maintenance. Wood can also be damaged in more ways than other fence styles, including termites, fungus, wood rot, and other damages. Vinyl fences come pre-cut and ready to install. They can come in various colors, and do not require painting or staining. Vinyl fences are fire resistant, easy to clean just by spraying the dirt off, and won’t split or crack. Vinyl fencing generally cost more than wood fencing. Also, in extreme temperatures, vinyl might expand or bend. Vinyl might have issues with mildew, and if not removed quickly it can leave a stain. Repairs generally involve replacing an entire section, so not quite as easy as wood fence repair. Aluminum fencing is not susceptible to corrosion, making it a potentially long-lasting fence style. Aluminum fencing is less expensive than steel fencing. Aluminum fencing is great for aesthetic purposes, and for pool enclosures too. Unfortunately, aluminum is not an incredibly strong material and can be easily bent. Aluminum fencing is not the best choice where security is the main objective of the fencing, steel is strong and a better choice. Steel fencing is strong and durable and can last for a long time. It is great for applications where security is an issue and because of its durability it can be very resistant to damage. Steel fencing can give you peace of mind when you need to protect assets. Steel fencing is heavy and more difficult to install, and can cost more than other fence styles.